Why Should You Have Your Chimney Cleaned? Chimney SweepingThe main reason you should have your chimney cleaned is to remove flammable creosote which accumulates inside your chimney. If these harmful deposits of soot and creosote are allowed to build up, they will eventually lead to a chimney fire. Don’t forget our furnace flue – Another important reason to have your chimney cleaned is to clear the flue to allow the toxic exhaust gasses to escape. Blocked furnace flue is among the leading causes of carbon monoxide poisonings. Our Sweeps will clean your chimney flue from the “bottom –up” – the modern and most recommended procedure for efficiently cleaning a chimney flue. Once the flue has been cleaned, our sweeps will inspect your chimney from the ground-up and provide you with a written record of service which will state the current condition of your chimney. 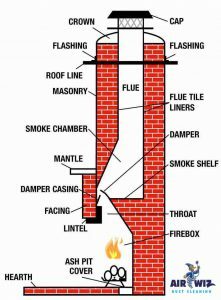 FIREPLACE AND CHIMNEY SHOULD BE INSPECTED YEARLY FOR FIRE SAFETY AND ANY STRUCTURAL FAULTS. We inspect your chimney according to the procedures recommended by the National Fire Protection Association. Your Safety is Our #1 Priority! The technician will check all the readily accessible portions of the chimney, its enclosing structure, and the flue. The inspection report includes verification that the flue is not blocked or restricted. A high power Soot Collector Vacuum ensures that no soot or dust escapes into your home. Than we brush the flue of the chimney from the bottom until the brush gets to the top. 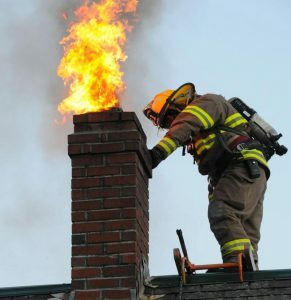 We make sure your chimney is safe. Every chimney cleaning comes with a safety inspection, no extra charge! Airwiz is the best reviewed chimney cleaning company in the area. You can see the reviews for yourself on review sites such as Yelp, Angie’s List and Google Reviews You can trust us because you can check it out for yourself. Don’t rush to hire! We recommend that you spend 5 minutes to learn a few things about chimney cleaning before choosing a company. 1) How is it done, what is your chimney cleaning process?